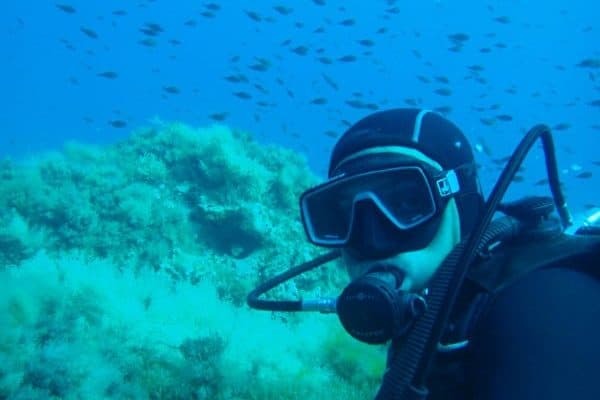 Diving in Kefalonia is an amzing experience, with crystal clear water and visibility up to 40m. You can glide through the warm waters and discover a range of aquatic flora and fauna. There are also several human archaeological and historical souvenirs: shipwrecks and potteries and the remains of a World War II Bristol Beaufighter. Kefalonia is known for its tectonic movements. The local environment experiences constant geological changes, which give rise to interesting caves, tunnels, cliffs and arches. A full selection of PADI courses are available, tailored to suit all abilities. There are more than 25 different dive sites for scuba diving, with daily boat dives to nearby islands to visit canyons, caves, wrecks and reefs. Each site is unique in terms of ﬂora and fauna. Snorkelling trips are also available upon request or just head out at the clubs, the water is clear and there is lots to see! Diving and snorkelling are great fun, however, participants should be water confident. You should also be able to listen and follow instructions. First of all, you will be given a briefing which explains the equipment, how it works and the effects of pressure underwater. You will be taught some scuba diving theory including safety rules and hand signals for underwater communication. There will also be various diving skills you need to learn prior to going in the water. Next, you’ll complete your first dives in shallow water. This allows you to become familiar with the equipment and practise your new found diving skills. Once you feel happy with these skills, you will be taken for a little exploration in a sheltered bay. This is the fun part. You won’t forget this amazing experience of breathing underwater! Discover this fantastic new world at a depth where you feel confident and comfortable. You will have an instructor with you, so your first experience in open water will be relaxed and fun, but importantly nice and safe. You might see a Loggerhead Turtle! They are the only sea turtle that nests around Kefalonia and the Mediterranean. 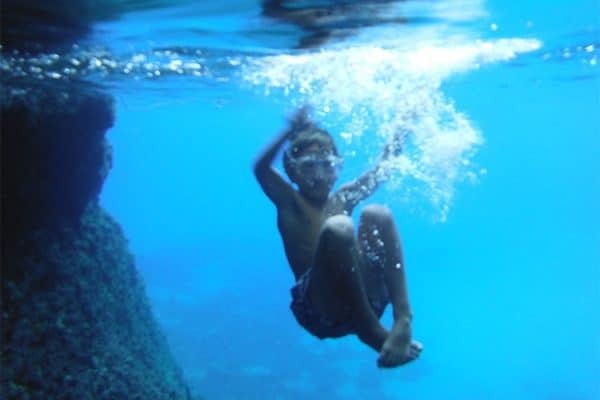 Bubble maker – A 45-minute programme designed to introduce the fun of scuba diving to children aged eight years and over. They can learn in a safe and controlled environment. Likewise, cutting out the out the theory allows them to immediately enjoy shallow water dives. If you are a qualified diver, bring along your log book and qualification card. 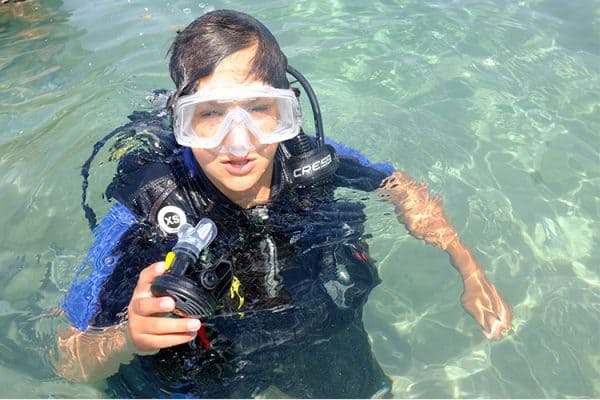 As a certified diver, you can enjoy trips to different dive sites. There you can explore various caves, wrecks and reefs. dive with a buddy independent of supervision. Plan, conduct and log open water non-decompression dives (max depth 18M). This is the first diving level that allows you to obtain air fills, scuba equipment and other services. You will be able to dive anywhere else in the world. You can continue your dive training with the PADI Advanced Open Water Diver. Cost: €430 (includes educational material, logbook, certification fees, equipment rental and boat trip). Fancy diving somewhere else too? Check out our Surf holidays where you can dive with an array of marine life!